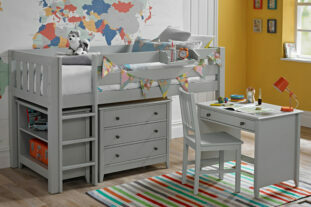 Mid Sleeper beds are ideal for children age 6+ years and perfect when space is at a premium. With either a play tent to make an exciting den or useful children’s storage solutions underneath. With a huge collection of beds available in a range of styles and colours, you’re sure to find the right children’s mid sleeper bed at Room to Grow. 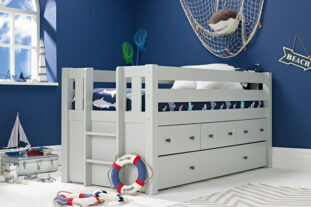 Kids mid sleeper beds offer a practical and attractive space saving solution for even the smallest of bedrooms. The multifunctional mid sleeper beds offer optimum comfort and excellent storage which is a necessity for any child’s bedroom. Space saving solutions such as mid sleeper beds for children will also open up the floor space for activities or even a second bed. 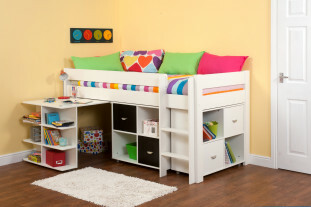 Room to Grow mid sleeper beds come in variety of designs from contemporary to colourful. If you’re looking for something more fun than practical, check out the range of den beds which will provide your little one with endless fun and you with a hidden space for that bit extra storage. 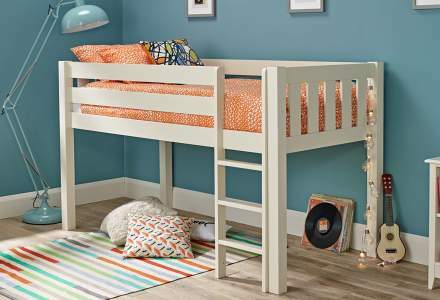 With plenty of options available, there’s a mid-sleeper bed suitable for any child. 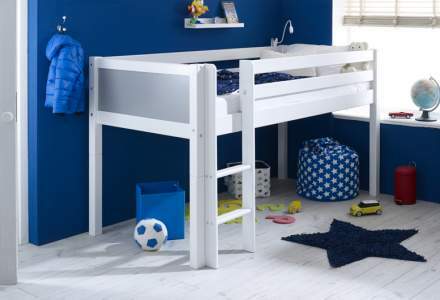 Some children’s mid sleeper beds come with an integrated children’s desk, which would provide your children with their own personal study space to complete homework, and others are geared up to maximise storage space; incorporating drawers and cupboards to utilise the entire underbed space. For more designs that offer integrated storage and in some instances, a desk, take a look at the cabin beds available. In fact, you can discover the benefits of both mid sleeper & high sleeper beds in our resource guide. Find your perfect mid sleeper and high sleeper bed with Room to Grow today. 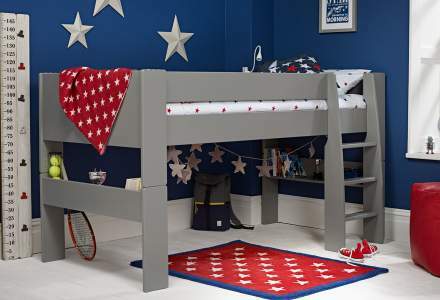 Due to the height of mid sleeper beds, they are recommended for children over 6. Although models vary slightly, you will find that most designs come with three steps up to the bed which tend to be fairly deep, so that they are safe and practical for children over 6.